Ruth Sternemann was born and raised in Wauwatosa, WI where she attended Northwest Lutheran Grade School and was a member of Covenant Lutheran Church. She graduated from Milwaukee Lutheran High School in 1981. Throughout her high school career she gravitated to the art room on a daily basis. She continued that graphic art education at Carthage College in Kenosha where she received a Bachelor of Arts in Graphic Advertising in 1985. Ruth began her career with Holsum Foods in Waukesha as their Advertising Director for 9 years. 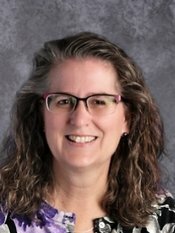 She was then approached to take over the Public Information Specialist position at Kettle Moraine School District (KMSD) upon the retirement of Germaine Hillmer. Ruth worked for KMSD for 13 years. In 2011, her former KMSD Superintendent Sarah Jerome, asked her to join the Arlington Heights School District 25 team as their Communication Specialist. On her way down to Arlington Heights one day she took Pastor Jeff’s call to come in and speak with him about Divine Redeemer’s need for a Communication Director. Ruth accepted his offer and has made Divine Redeemer her home and enjoys being part of their team. The Lord has blessed her with a talent for communicating through website design, print materials, and photography/videography. Ruth lives in Delafield with her husband Paul and her two girls, Emily and Samantha, ages 18 and 22.